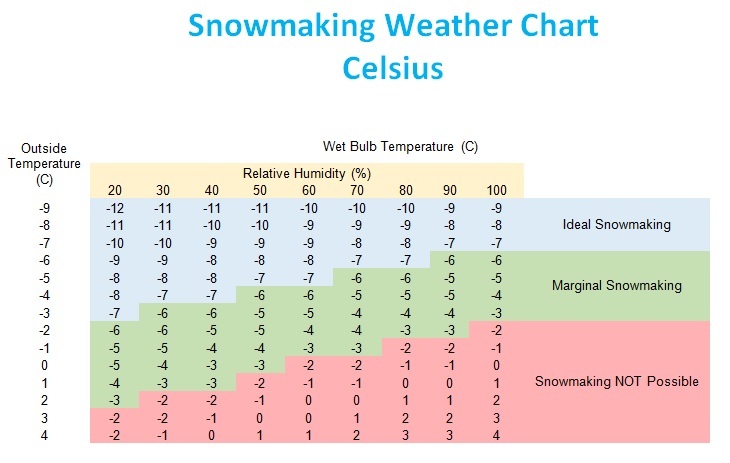 In order to make snow, you need the correct wet bulb temperature. Wet bulb temperature is directly related to both relative humidity, and outside temperature. This chart shows the wet bulb temperature at a given temperature, and relative humidity. The lower the wet bulb temperature, the higher quality of snow you will produce. If the wet bulb temperature is located in the light green area marked “marginal snowmaking” then the snow you make will be more wet than the ideal snowmaking area located in light blue.